Fr. Richard on local 12 TV talks about the importance of social media with anchor Rob Braun. Religious Orders using social media to attract new candidates. Religious vocations throughout the United States have been increasing in the last few years. Recently, Vocations Director Fr. 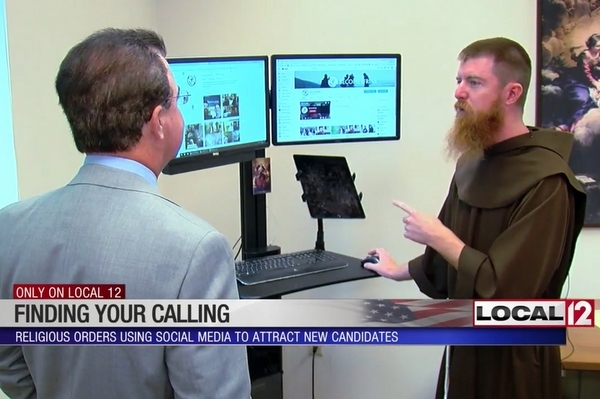 Richard Goodin, OFM, was interviewed by Local 12 TV news anchor Rob Braun about the important role that social media plays in attracting religious vocations. You can see it here. Fr. Richard has had a full summer of activity. In June, he accompanied our postulants on a mission trip to Jamaica that coincided with a mission trip of students from Roger Bacon High School. Vocation meetings, conferences, and interaction with high school students have kept him busy in Washington, D.C., St. Louis, and Cincinnati. Currently, he is back in Jamaica serving as a vacation substitute for a Jamaican priest so that the parish Masses can continue uninterrupted. September will be busy planning school and college visits.